Matt McLean and Tim Newman general manager tbs. While for many in the timber industry there may be appear to little synergy between car racing and timber building that’s not the case with tbs, not only do a number of staff come from a background in automotive engineering but Mr Newman said there was a lot of similarities in how tbs and motorsport operates. Like motorsport, modular building, which is tbs’ line of work, requires highly skilled engineers, a very high level of organisation and teamwork. The tbs sponsored car is being driven by Australian national karting champion Matt McLean and it is an ex-Stone Brothers V8 Falcon as raced by Tim Slade in the 2012 V8 Supercars series. 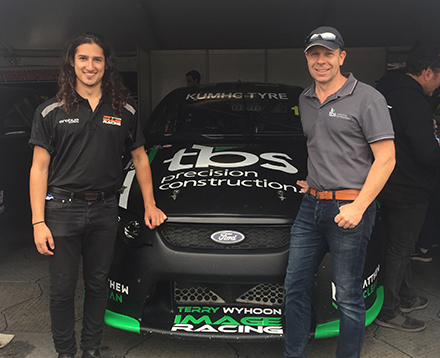 Image Racing and well-known Erebus Motorsport are both involved in the 2019 tbs car which ran at the first event at Philip Island last weekend in a field of more than 20 cars and qualified 9th fastest and finished 8th in Saturday’s race.